New data on console game attach rates (or 'tie ratios') has emerged, which basically shows how many games are being bought on average by consumers for the Nintendo Wii, the Microsoft Xbox 360 and Sony's PlayStation 3. Gamasutra published the chart you can see to the right, which shows each of the three console's attach rate, as well as a break-down between first-party and third-party game releases. What is a tie ratio? 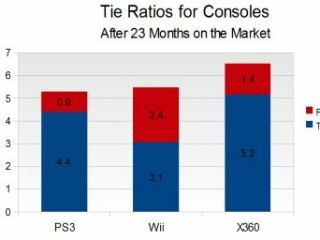 Gamasutra's Matt Matthews explains that a console's software tie ratio "is the ratio of the total number of software unit sales to the total number of hardware unit sales" which "gives an average number of software titles per platform owner." A few straightforward conclusions can be drawn from the latest info, based on each machine's position after 23 months at market, which is that Nintendo's first-party software dominance is clear in comparison with Xbox 360 and PlayStation 3 owners. No great surprise there then, what with pretty much every decent game for Wii being developed by Nintendo's own studios. Overall, Gamasutra's data shows that the Xbox 360 has the highest attach rate of the three current gen machines, with around 6.5 games sold per console. Nintendo's Wii comes next, with around 5.5 games per machine, and PS3 has the lowest attach rate at round 5.2 games bought per console.